Whether you work at heights everyday or just once in awhile, your safety focus during those times is of utmost importance. It takes one mistake to turn a routine work task into a fatality. Falls are debilitating. Falls are deadly. You must be prepared to protect your employees each and every time they could be exposed. Working at height refers to any work that is above ground or below ground in which a person could fall and injure themselves if no precautions are taken. You could fall off a ladder, off a roof's edge, or through an opening on the floor. In the general industry, fall protection is required at 4 feet above a lower level. 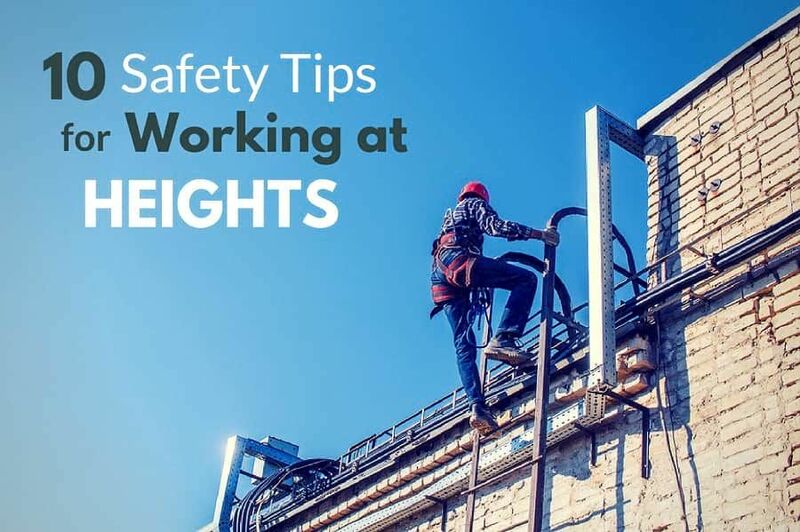 Here are ten safety tips to consider if your employees work at heights. When you can, use railing. Passive protection is the easiest way to keep your workers safe in order to achieve compliance because there is nothing that they need to actually do to keep themselves safe (other than stay within the rails…and if your employees are climbing outside of protective rails, you’ve got bigger problems to address!). There are railing system for almost every style of rooftop like non-penetrating railing for flat or low-slope roofs, parapet mounted railing, metal roof railing, and more. Pre-fabricated railings can be permanently affixed or portable to suit your needs. Regardless of which type you use, once in place, you’ll find rails to be the easiest fall protection system to use. If you’re going to use Personal Fall Arrest Systems (PFAS), you need to ensure you’re choosing the proper equipment. All full-body harnesses that meet ANSI standards will perform the same, despite their cost, however, that price differential is getting you something. Sure, sometimes it’s just a name, but other times, it’s functionality that you’re getting or sacrificing, such as extra D-rings, fireproof material or arc-safe design. Sometimes, a more expensive harness is more expensive simply because it’s been made to be more comfortable. Do your research and decide what you really need. If you have workers welding at heights, then a standard nylon harness is probably not going to be what you need. Perhaps Kevlar is the way to go. And, don’t forget your workforce. Perhaps comfort isn’t your main concern (though it’s certainly much easier to get cooperation from your workers if they are comfortable wearing the equipment), but that’s not the only consideration you need to make. Harnesses are not one-size-fits-all. Make sure your workers can properly adjust their harnesses so that they fit correctly. Lanyards need to be properly selected as well. Depending on the height at which you are working, a 6’ lanyard with a deceleration device will not protect your worker. Instead, a retractable lanyard may be necessary. Each situation is different, so you need to evaluate your working conditions and the task to be performed in order to give your employees something that will actually protect them. Employees can use all the equipment they want, if they’re not inspecting it, it could fail anytime. When it comes to harnesses and lanyards, while they need to be periodically inspected by a Competent Person (one with the knowledge to recognize the hazard AND the authority to correct it), they should also be inspected by the user prior to every use. In order for this to happen, your users need to understand what they’re looking for, what is acceptable and what is not, and what to do when they find a problem. The inspection should be thorough, but does not need to take a lot of time. Even so, this brief pre-work check could save a life. You can wear all the fall protection equipment in the world, but if it allows you to hit the lower level before it engages, it’s pointless. This may sound like a "common sense" statement, but you’d be surprised at how many people don’t seem to have “common sense”. It is not unusual to go onto a construction site or observe a maintenance crew in a plant and see a worker at 10-12’ off the ground wearing a 6’ lanyard with a deceleration device. While at first glance you might think that it should work, there are a number of reasons why it won’t. First, you have to add 3.5’ of distance to account for the deployment of your deceleration device. Already that means the lanyard itself is 9.5’ long. Unless you are a 6” tall person, this is some pretty bad news. Your actual fall distance needs not only include the length of your lanyard when deployed, but also your body length below the D-ring and any sag in your harness and anchor system. Count on a good 18.5’ minimum before you’re able to use a 6’ lanyard with deceleration device. As Grandpa said in The Lost Boys, "We’ve got rules!" Sure, he was referring to drinking his root beer and not peeling the label back on the TV Guide, but he might as well have been talking about anchor points. If you were to pick a construction site at random right now and see what they’re using as anchor points, you might assume there were no rules. PVC pipe? Not an anchor. Decorative steel? Not an anchor. In fact, many more things will NOT be an acceptable anchor point than WILL be an acceptable anchor point. Why? Because the anchor point must support not only the weight of the person attached but 5000 lbs. per person attached (or a factor of 2 if you’re having an engineer to determine your anchor). Many fixtures are not going to withstand those forces. Structural steel using a proper beam clamp? Sure. A manufactured roofing cart or other manufactured anchor? Sure, if installed properly. To see an example of a compliant, and easy to install anchor point take a look at the Weightanka deadweight anchor. Short of that, you’re going to need some documentation and/or an engineer’s approval to use something as an anchor point. Just as harnesses are not one-size-fits-all, neither are fall protection solutions. In some situations, a scaffold is going to be your best solution to work at heights. If so, you’ll probably be able to equip them with rails, making your fall protection much easier to address. Other times, scaffolds will be infeasible and you’ll find yourself on a lift. Depending on the type of lift, you may or may not need to wear a harness and a lanyard (and properly tie off). Still other times, you’ll need to use a ladder, at which point the requirements for fall protection become trickier. In the end, thinking that a ladder is going to suffice no matter what situation you’re in (or a lift, or a scaffold, or any other means of elevation) is only asking for problems. Evaluate your situation carefully and determine the right piece of equipment suitable for the task in that location. Don’t just assume because you have a ladder at home, you know what you’re doing. In fact, the safest way to live on this planet is to always assume you don’t know what you’re doing. In most cases, you’re going to be right! 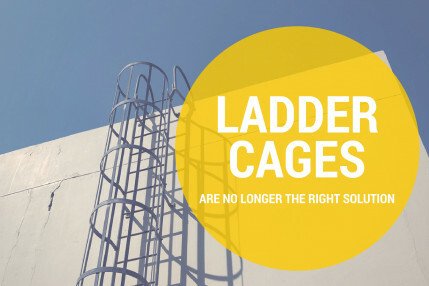 Ladders lie at the source of many industrial and workplace accidents simply because we take their use for granted. Ladders are familiar. You use them to hang your Christmas lights, paint the living room, change that annoying hard to reach high-hat bulb, and clean your gutters. We use them so often that we must know what we’re doing because we’ve never gotten hurt before! Well, except for that one time you closed the A-frame on your hand or that time, the ladder slipped out from under you or that time you had a tool on top of that ladder that fell onto you or that time….well, never mind. Ladders are dangerous. When improperly used, they’re REALLY dangerous. First, make sure that ladders are the best way to do what you’re doing, then make sure your employees know how to properly use them. 3’ extension, 4:1 ratio, 3 points of contact, and secured. If you don’t know what that refers to, you may not know how to use an extension ladder properly. You know that sticker on a step ladder that says, "Don’t stand on this step or above."? If you think that means you can step there but no higher, you might not know how to use a step-ladder. Provide your employees with proper training so that they use the tools they are being given the right way. Also, if you are going to be using a fixed ladder, make sure that it is protected by a ladder safety gate or an offset. Chains are no longer compliant and need to be replaced with one of the aforementioned solutions. 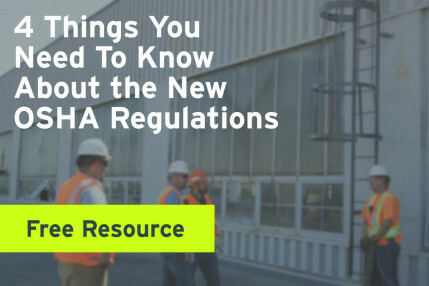 Roofing regulations are some of the most misunderstood requirements. Not only do roofers not know exactly what is required of them most of the time, but many other contractors working on roofs who are not roofers believe that certain methods of fall protection are available to them when, in reality, they’re not. Warning lines at 6’ with a monitor are only allowed for roofers performing roofing work (and 10’ back from the edge if there is mechanical equipment traveling in that direction). Notice the phrase "with a monitor" in the previous statement. There is NO situation in which a warning line is an acceptable means of fall protection that does not also include a dedicated monitor being present. There are a few that allow for a monitor with no warning line (low-slope roofs less than 50’ in width for instance), but none that allow a warning line with no monitor. Also, notice the phrase “dedicated monitor” in that previous statement. Monitors must not have duties that would distract them from performing as a monitor. You see where I’m going with this? There are many nuances to the rules for roofers. If you are one, make sure you are familiar with the regulations and your requirements or speak to somebody who is. There are many ways in which a lift operator can do something wrong, so I won’t get into the actual operation of lifts here, but we do need to discuss fall protection in regards to lifts. One thing that gets missed quite often is that any person in a boom lift, at any time, at any height, must be properly tied-off. "Properly tied-off" not only means that they need to be secured to the engineered anchor point designed with the lift, but it means that they can’t wrap their lanyard around the rails and they need to have a lanyard that is actually going to protect them at the height at which they are working (see fall distance above). With scissor lifts, things are a little different. While the site you are working on or the owner of the facility/project may require you to tie-off in a scissor lift, there is no regulatory requirement to do so. However, the moment you forget to close your gate or secure your chain, you are no longer protected by the rails and are now in a fall protection violation. It’s that simple. Also, keep your feet planted firmly on the platform. Both of them. It’s been mentioned in various paragraphs above, but it can’t be stressed enough. If you want your employees to work safely at heights, they must be properly trained. Period. The end. Not only is training required by law, there is just too much room for error and confusion when it comes to a person without the proper knowledge trying to protect themselves at heights. Falls are the leading killer in construction year after year. Many people in other industries die from falls as well, so they are very deadly. Most of the time, there are no do-overs. Arm your employees with the knowledge they need to keep themselves safe. Working safely at heights does not come by chance. It is not something you luck your way into. Working safely at heights takes preparation, education, and determination. When it comes to fall protection, you can’t have too much information. John Braun has been in the EHS field for more than 16 years. He achieved his CHST in 2005 and his CSP in 2010. 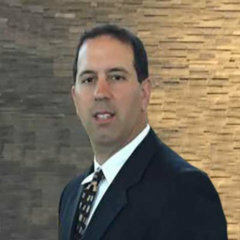 Though he focuses on construction, his background includes manufacturing, recycling, and warehousing facilities as well. John holds a Bachelor's degree in English from The College of NJ. As of the release of the new Walking/Working Surface standard, ladder cages are being phased out. 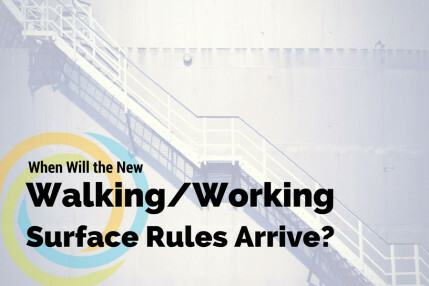 When Will the New Walking/Working Surface Rules Arrive?